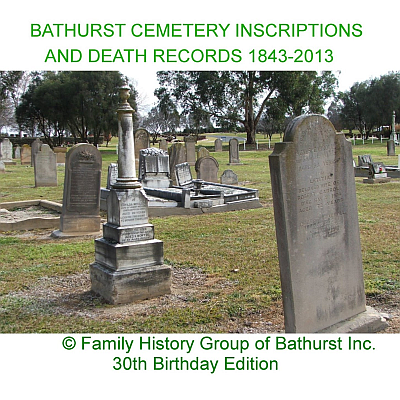 There are nearly 20,000 records in the database for the Bathurst General Cemetery. There are over 14,000 records in the part of the cemetery now known as Bathurst Monumental cemetery and this is divided into areas: Church of England; Catholic; Presbyterian; Methodist (including Wesleyan); Baptist; Seventh Day Adventist; Salvation Army; Non Denominational (Chinese); Independent; Lutheran and War graves. The newer part of the cemetery or Maranatha lawn cemetery contains over 5,000 records and consists of lawn sections: Maranatha 1,2,3 & 4; two columbarium Walls A & B and a baby section Birralee. A cemetery map can be printed. The program contains 11,000 thumbnail photographs and inscription details for all headstones together with any other known but unmarked grave details. Searches can be by any combination of Given & Last Name (including wildcard searches) date ranges; area; section; others in grave; all in row and all in section. Searches also show grid map location of grave and aerial view of cemetery section. To prepare the CD, every headstone in the cemetery was transcribed and photographed in 2013-2014. See order form for current pricing. Use our Order Form for convenience and payment by credit card or EFT. To purchase the CD, please send your request with payment to Secretary, BFHG, PO Box 1058, Bathurst NSW 2795. Direct email enquiries to our secretary or download order form here for current pricing.